The Volcanoes CJ knows erupt bouncy balls (Dora's Bouncy Ball episode), foamy pink, purple liquid and she thinks they are super cool and fun! May be we have to read books about the real volcanoes. When we read the book - If You Take a Mouse to School , few months ago(back to school books), She said "Mommy look at that Volcano experiment. Can we do that at home" and I said oh yeah we can try it one day. Finally the day arrived. Yay! We did it! and a big thanks to Jamie - Hands on as we grow for the concoctions challenge. Spend [at least] 15 minutes of uninterrupted time mixing concoctions with your kids. Concoct a mixture of ingredients you have in your cupboard [flour, spices, sugar, cornflour, cornmeal], or vinegar and water. Explore how they combine and what happens. Stir and mix, or squirt and spray. Add color to make it interesting if you choose! Mix 3 cups of flour, 1 cup of salt, and 1 cup of water. knead the dough with 2 tablespoons of cooking oil. I guess play dough/Salt dough will work perfectly too. Place the plastic bottle in the pan. Mold the dough around it into a Volcano shape. Don't cover the bottle opening or drop the dough into the bottle. 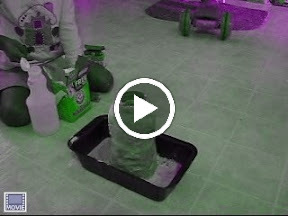 The advantage of the baking soda Volcano is you can recharge your volcano to make it erupt again and again. If you are trying the experiment, don't throw away the dough, Stay tuned! We have a fun project coming up! :-) brilliant. We still need to do this one. I love this! You are quite a scientist promoter. Great photos. I hope you'll visit my blog: Kindergarten for Teachers and Parents.